Successfully Added KM8 Android 6.0 TV Box - Amlogic S905X CPU, Mali GPU, 2GB RAM, Kodi 17.0, Dual Band Wi-Fi to your Shopping Cart. The KM8 TV box is the latest generation of TV boxes and features the powerful Amlogic S905X 2.0 GHz processor paired with 2GB RAM and an Android 6.0 operating system, for silky smooth operations without any interruptions. This means you will be able to surf the internet, play games and enjoy apps such as YouTube, Netflix and Hula. With the penta core Mali 450MP GPU all this content will look stunning and you have a full future proof devices that supports 4K decoding and output resolutions. For even more media including the latest shows and movies you can tap into the powerful Kodi media player. Version 17.0 comes preinstall on the KM8 TV Box so there are countless hours of entertainment available, right out of the box. Quick and easy to set up the KM8 benefits from dual band Wi-Fi supporting both 2.4 and 5 GHz channels. This means great signal range and stability as well as faster wireless connections, allowing swift fault free data transfer without the need for cables. Now you can stream from anywhere as without needing an Ethernet cable connected, bringing you the freedom to set up this TV box in any room of the house. With its Android 6.0 OS and a wealth of apps available this TV box supports almost every common media format. It comes with 16GB of internal memory that can easily be boosted via the micro SD card slot. 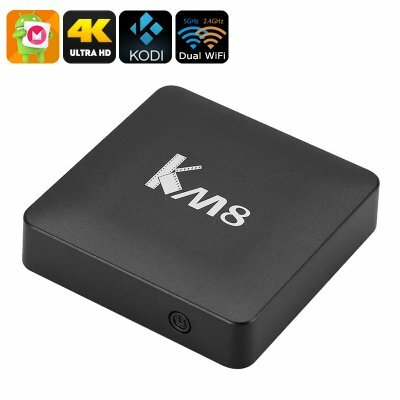 The KM8 Android TV box comes with a 12 months warranty, brought to you by the leader in electronic devices as well as wholesale Android TV Boxes.. These TV Boxes are exactly as advertised and I am pleased with the prompt, efficient delivery....VERY PLEASED!! !